N-isopropylacrylamide and N-3-(aminopropyl) methacrylamide. This leaves us with a surface covered in polymer hairs (polymer brush), the free amino groups of which are functionalized with Ru-bipy groups. Not by coincidence this group is associated with the Belousov-Zhabotinsky reaction. A BZ reaction will take place starting at the opening of the capillary when a solution of nitric acid , potassium bromate and malonic acid is introduced. When viewed with a fluorescence microscope, the fluorescence intensity shows an oscillation. All due to a wave of oxidized ruthenium (hydrophilic and extended) in a sea of reduced ruthenium! For the synthesis of new compounds synthetic organic chemists rely on a whole bunch of coupling reactions. In two of them, one reactant is an aryl bromide and the other a organoboron compound in the Suzuki coupling and an organotin compound in the Stille coupling. Giannerini et al. (Ferenga lab) note here that these starting materials often derive from the same organolithium compound, so why not try out coupling reactions using organolithium compounds in the first place? Things to watch out for according to Giannerini: ease of homocoupling and ease of lithium - bromide exchange resulting in dehalogenation. Proper choice of solvent should control RLi aggregation state and therefore reactivity and therefore toluene was selected as solvent. A combination of in-situ combined tris(dibenzylideneacetone)dipalladium(0) and tri(tert-butyl)phosphine was found to be very effective. Interestingly commercially available Pd(tBu3P)2 did not perform as well in several cases. Because RLi compounds are highly reactive the reaction can now take place at room temperature and turns out to be very fast. Given the wide availability of organolithiums and affordability it seems the Stille and Suzuki couplings face an uncertain future. Note added: Reader T. disagrees, with substrates with various functional groups Suzuki is still the way to go. This blog agrees! headline too sensational! Kyle Knust at al. explain here how they intend to desalinate sea water not with established methods such as multi-stage flash distillation or reverse osmosis but by electrochemistry. In their proof of concept the anodic pole of a bipolar electrode sits in the middle of a junction of a branched microfluidic channel. Sea water spiked with fluorescent tracer tris(bipyridine)ruthenium(II) chloride is fed into the system and voltage (3 V) applied. Interestingly the channel partially blocked by the anode is 25% less saline (by conductivity) and the fluorescent tracer material also opts for this channel. The rationale? At the anode chlorine ions are oxidized to chlorine gas creating a local "ion depletion zone" and a electric field gradient motivating ionic species to move away from it. Entirely happy? What is the "ion depletion zone" exactly. As chlorine ions get oxidized, sodium ions accumulate causing all incoming ions to reroute. You might as well call it an accumulation zone. Another matter: the bipolar electrode was at one time a distinct research interest of Martin Fleischmann, you know the guy we are supposed ridicule for 20 years to come and then revere as a genius. This Daniell cell without a bridge also has the look and feel of electrolysed water. More explanations are in order but the paper does not provide them. Finally, being a microfluidic device the output is only 0.04 microliter per minute. So there is some way to go. But at least we have the movie! Already briefly mentioned in the virtual 2008 chemistry vacation this blog this year actually visited Fortress Sonnenborgh in Utrecht. Here is the report! Most people visit to see the guns or the astronomical observatory but at the bottom of the fortress is situated the chemical laboratory of Conrad Barchusen, local university professor between 1702 and 1723. 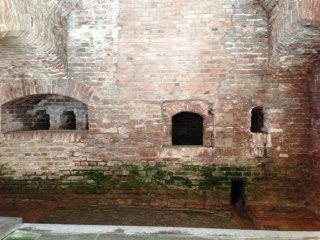 Today it is not much to look at: basically a dungeon equipped with an oven. The fortress was already in disuse when Barchusen took over so ideally suited for heating stuff and blowing things up without hurting anyone. Some if the inventory wound up in the cesspit from which an alembic was rescued, now on display (see photo, entry dungeon in the back). The information display mentioned that even more equipment from the laboratory was uncovered and located in a museum nearby. But which museum and where? The guy at the ticket booth was not much of a help, he did not even know the laboratory existed in the first place ("sorry, I started this job only recently"). The information people in the museum next door were not much help either, this museum does have an archaeological department but the displays are messy to say the least. Lots of stuff displayed in display cases but without any description. 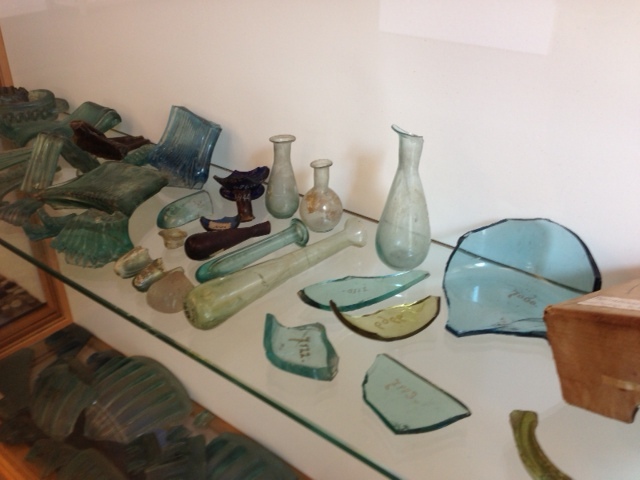 Yes ancient looking test tubes are among them (photo below) but these might just as well be Roman. Where did all the Barchusens stuff go? Back into the cesspit?